In multiple faucet draft systems you will have to deliver the pressurized gas to each of the active kegs. To do this you will have to split the gas delivery into the number of divisions needed to serve the kegs in the system. In most cases this can be done from one gas source. The exception is when nitrogenous beer will be served alongside standard beer and two different gas sources are used. 1. Simply splitting the gas line with a "Y" or "T" fitting either at the regulator or just before reaching the keg. Using a "T" or "Y" limits the splitting from one to only two lines. For multiple lines and for safety and security see number 2 below. 2. 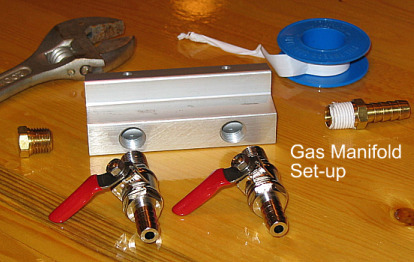 Using a specially designed gas splitter called a manifold to split the gas flow into multiple equal divisions. 3. Sending the gas through a series of "secondary" regulators to deliver variable pressure to each keg. If your system has multiple faucets and beers with different pressure requirements, you will need to use secondary regulators. Learn more about them here. Of these, installing a gas manifold is the best choice when identical pressure will be delivered to each keg in the system. The manifold will allow for secure and stable installation of your gas lines within the cooler and allow for use of individual shut-off valves for each gas line. This improves the safety of the installation and helps prevent minor leaks on an unused leg in the gas line from draining your gas cylinder. The manifold itself is a hollow aluminum, plastic or brass block with threaded holes drilled into it for the gas entry point, the gas to keg exit points and pass-through point. Each of the drilled holes must be occupied by a hose adapter, outlet valve or plug for the manifold to function. Once assembled the gas will flow into the entry point on one end, flow out the exit points and either flow out the pass-through point or be stopped there by a plug. The pass-through can deliver gas downstream of the manifold - usually to another manifold assembly when needed. In most cases the pass-through is plugged. The body of the manifold will have a flanged mounting surface with screw holes. Use these to screw the manifold to the inside wall of your cooler or kegerator. It is a good idea to mount the manifold as high as possible to protect it and the attached valves from being damaged by moving kegs. Splitting gas lines using a manifold allows homebrewers with Cornelius kegs to use shut-off valves with integrated check valves to prevent liquid back flow into the gas system. This is an often overlooked device that can save your regulator in the event of a sudden pressure drop. The check valve operates indepentantly of the on/off valve and all Cornelius keg systems should have them. Of course standard keg couplers already have check valves installed within them.